The 13th Conference of the Parties of the Convention on Biodiversity is almost over, and especially if we succeed to get some last minute breakthroughs in the application of the precautionary approach to gene drives and synthetic biology, and the acceptance that true consent can only be free, we can look back on a pretty successful conference. One of the most important successes of the conference will hopefully be the explicit recognition, in many decisions, of the important role of community conservation initiatives like Indigenous Peoples and community conserved territories and areas and related traditional knowledge and customary practices in biodiversity conservation. The Parties to the CBD have also started to pay greater respect to the role, and rights, of women related to such initiatives, and biodiversity conservation in general, and committed themselves to more systematically mainstream gender in National Biodiversity Strategies and Action Plans. Yet, there is still a long way to go, as one of the outcomes of the first round of Community Conservation Resilience Assessments that took place in 10 different countries in the course of 2015 was that community conservation initiatives are under serious threat by the trends that happen outside the areas that they protect, including climate change caused by tourism-related aviation to destinations like Cancun (one of the most rapidly expanding sources of greenhouse gas emissions), the expansion of monocultures of trees and other crops, unsustainable livestock production and extractive industries. One of the discussions at COP13 focused on “mainstreaming” biodiversity into these destructive sectors. But this term risks becoming a euphemism for planting a couple of trees back into an area where the forests was raged down for cattle ranching, or, worse, as compensation for the polluting flights that brought people to Cancun. Rather than mainstreaming biodiversity, we should mainstream community conservation, and make it the rule, rather than the exception. All over the world, community conservation initiatives have demonstrated that sustainable livelihoods can be developed in true harmony with nature. So why are they still seen as an exception? Why do we still take the cynical approach of protecting only 17% of our planet through protected areas and other effective area-based conservation measures, instead of striving for 100% conservation by people, and for people? Let us look at this 17% target from a forest perspective. According the 2015 Forest Resources Assessment (FRA), almost 60 countries in the world still have a natural forest cover left that covers more than 50% of their territory. Allowing these countries to “protect” 17% of their territory only would imply a significant forest loss, with devastating impacts on forest biodiversity. Moreover, Sustainable Development Goal 15.2 calls for halting all deforestation and forest degradation by 2020. And the good news is that 129 countries have already succeeded to halt forest cover loss according to the same FRA 2015. Admittedly these FRA data are quite heavily disputed, also because there is an ongoing direct and indirect replacement of forests by monoculture tree plantations in many of these countries. Yet, the remarkable diversity of the list of countries that truly succeeded to halt forest cover loss, which includes countries from all continents and all levels of development, makes it clear deforestation is neither necessary nor desirable for development. Forests can easily be conserved, provided they can still be used in a sustainable manner by the communities that inhabit them. So let us please reject the cynical 17% approach and go for the 100% forest conservation, and biodiversity conservation, that is mandated by both the Sustainable Development Goals and the CBD Aichi Targets. Provided conservation is done in harmony with communities, this can easily be done. Download and read ECO here. Photo credit: Martinus Sinani, SPI Indonesia. 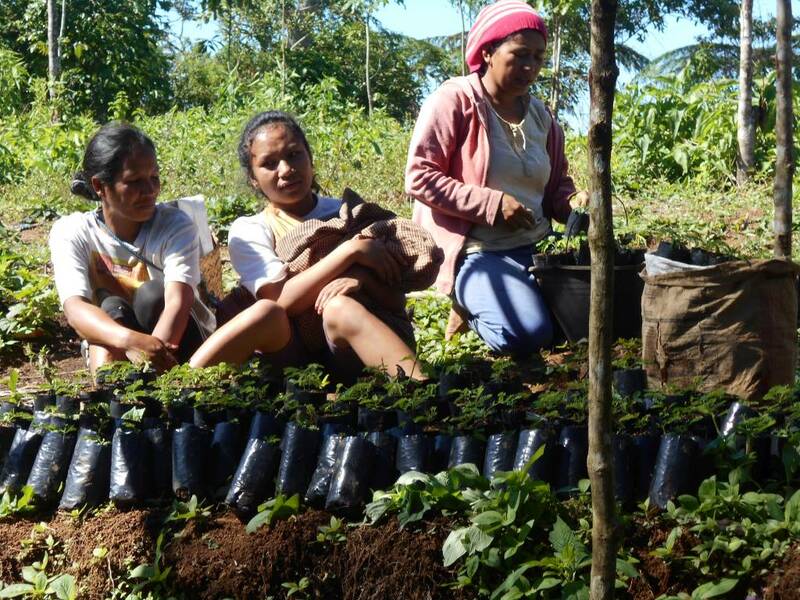 Indigenous forest women of East Nusa Tenggara working in tree seedling plot.